Here is a summary of everything I wore in Feb. Which is your favorite? Which should I donate to the Goodwill? Be honest, you won’t hurt my feelings, this is a learning experience for me too! Don’t forget to ‘like’ me on Facebook if you haven’t already (and if you do actually like me!). You’ll see the ‘like’ box on the far right down low. And also don’t forget your daily vote for Top Mommy Blogs. One little click where it says ‘we’re # 10’ will do it- that’s it! Thank you so much! 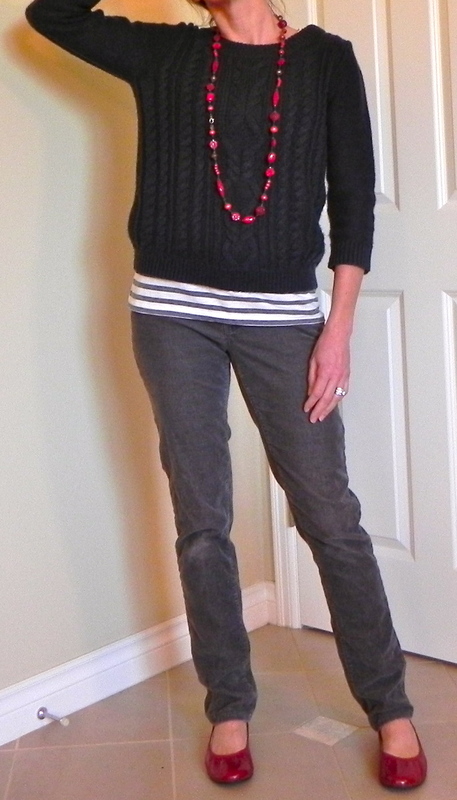 As per usual, it’s Wednesday so I’ve linked with the Pleated Poppy for What I Wore Wednesday and also Rolled Up Pretty! Check them out! Today I’m showing one of my new purchases, a yellow blazer. I have gotten really into blazers/ jackets this year. They are perfect for layering- and seem to add a little more polish than a simple cardigan. Similar to yesterday’s blazer, this one is also jersey knit- so it is literally like a sweatshirt. Can’t get more comfy than that! I’ve paired this with a blue and white striped shirt. 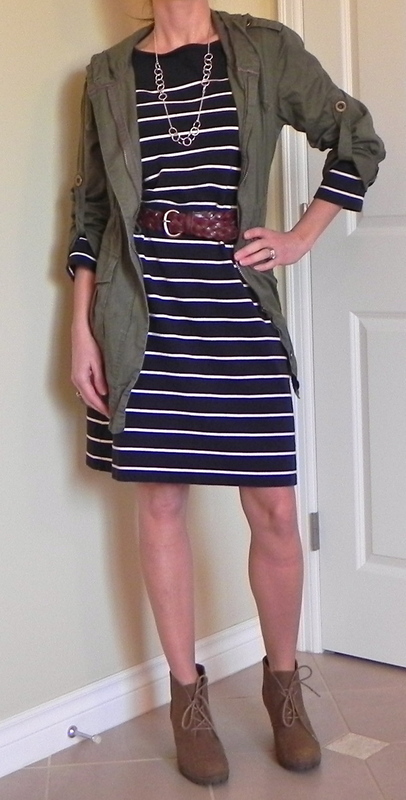 I can’t get enough of stripes! However, alone, they aren’t that exciting. I’ve paired my blazer with straight leg jeans and wedge heels. This is a bit of a risk for me. 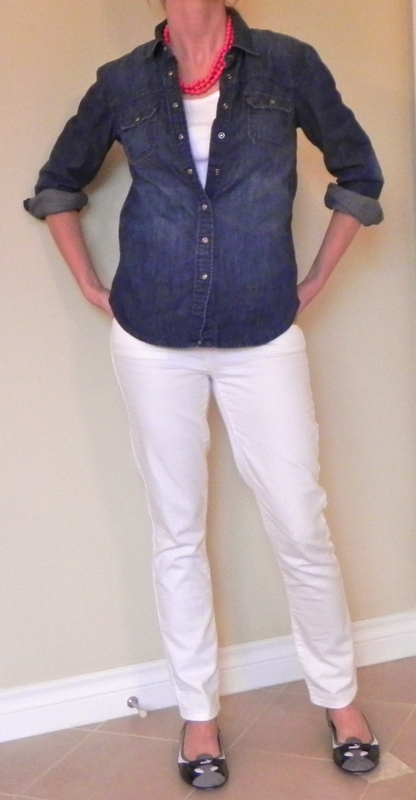 I rarely wear heels with jeans like this, but thought it might be fun to try. What do you think? Should I stick to flats? Or for running errands my cute new Pumas would be perfect. And by the way, do you want to see my list? What am I missing? What should I skip? 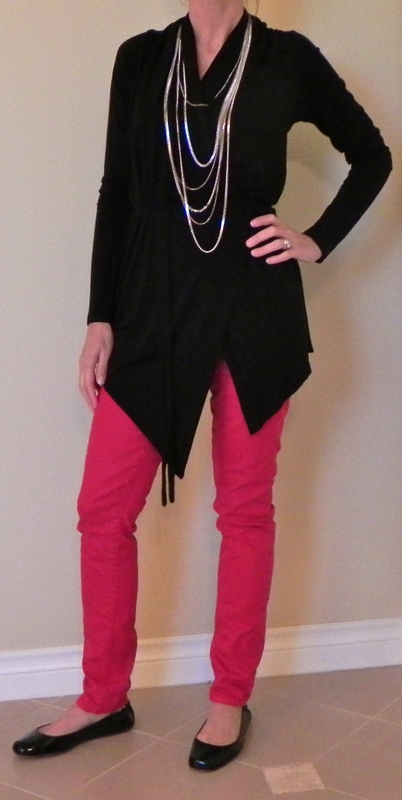 Of course, since it’s Friday I’ve linked up with my friends at Girlymama for Fashion Friday. Check it out! Feb 23rd, Found: Skinny Cargos! 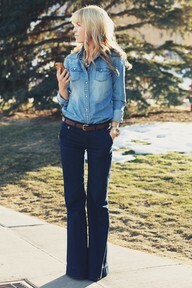 February 23, 2012 February 23, 2012 by Megan7 Comments on Feb 23rd, Found: Skinny Cargos! 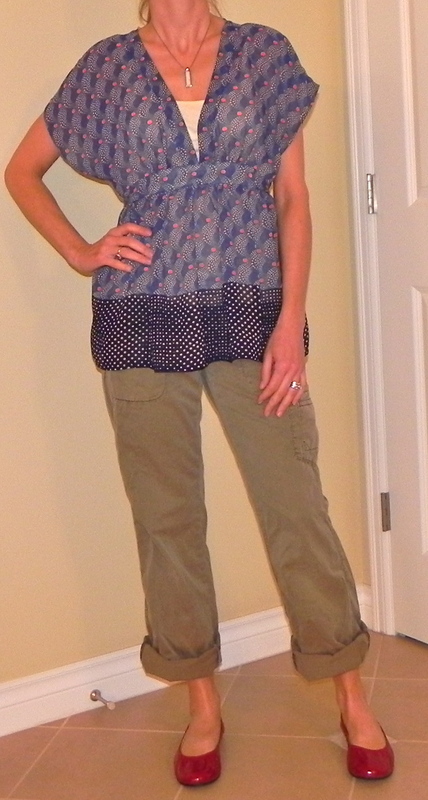 Thanks to the astute shopping eye of my younger sister (love ya K), I am now the proud owner of skinny cargos! Whoot Hoot! They were a little more than I planned on spending- but since I’ve been wanting them for a while (and was able to pay cash for them), I decided to splurge. However, as you can see on the right- paired with this frumpy cardigan and black shoes the outfit isn’t quite working for me. On the left I have replaced the cardigan with this fabulous cotton blazer from Kohl’s. I love this blazer- it’s made of french terry & honestly feels like a sweatshirt. It moves with my body and is comfy and warm! Plus, peplums are all the rage this season! 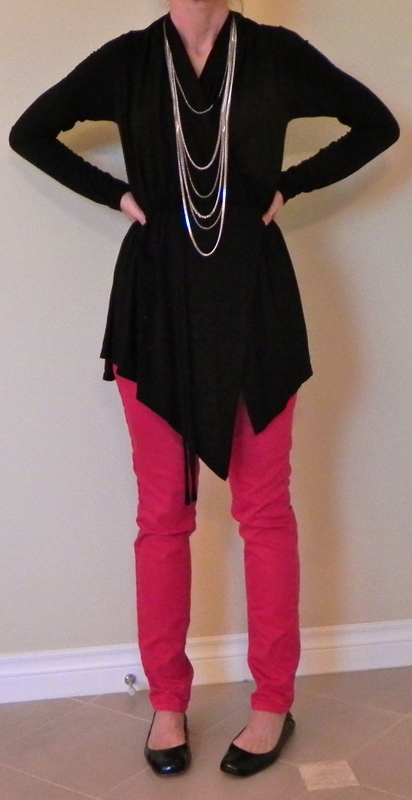 Other changes: I’ve added a necklace to help break up the solid blue of the tank and switched out my awful black shoes for my cute ballet flats. Lastly I have on this cute bracelet from Stella and Dot. My friend, Carrie, sells this jewelry and she graciously gave me this fun bracelet. I love that it looks like a stack of bracelets (arm party), yet it’s actually only 1 piece! Cool! One more note- please (if you want to) click on the link above right that says ‘vote for us’. You can vote daily- and as of now in the fashion category I am in the top 10! Wow! Thank you so much!! I would have NEVER worn a blazer with cargos before this. This is a risk for me and I actually really like the way it looks!